Glen Szymoniak, superintendent of the Klamath County School District, said the district is an amazing place for staff and students. Originally the Crystal Apple Awardees were only nominated by school administrators. In 2017, the district opened the nomination process to staff and students and continued that tradition this year. The Klamath County School District is honoring its best with the seventh annual Crystal Apple Awards. Sergio Cisneros remembers taking keyboarding at Mazama High School, literally in the same classroom, staring at the same brick wall that his students do today. The Crystal Apple award winner, now a business teacher and FBLA advisor at his alma mater, uses his experiences – and his struggles – as a way to inspire and establish common ground among the teenagers who are dealing with the same issues he dealt with a decade ago. Cisneros, 28, was nominated for the Crystal Apple award by six former and current students who described him as inspirational, a selfless leader, a role model, an anchor and the ultimate resource for every student. Cisneros learned English in elementary school, motivated by his desire to read Pokemon cards. His family owns and operates Sergio’s Mexican Restaurant, where he worked growing up. After high school, hewent to college, studied political science and economics and after graduating and working for a time, returned to Klamath Falls before applying to law school. 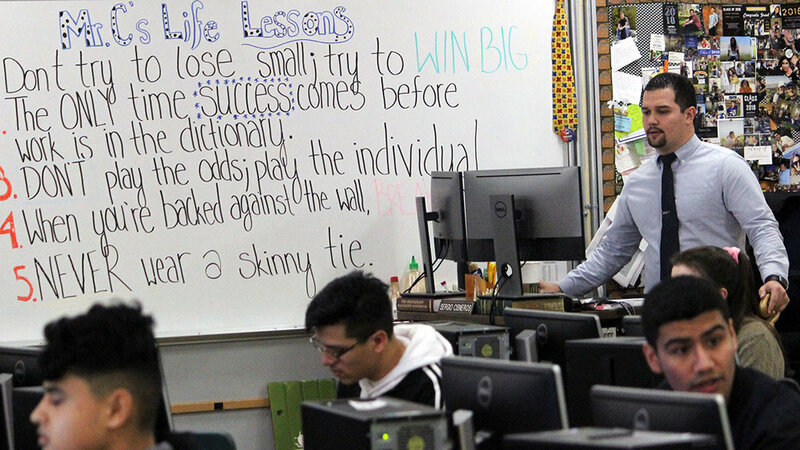 After picking up what he thought would be a temporary substitute teaching gig, he realized he had found his calling and has been teaching business and leadership skills to high school students ever since. At Mazama, he is an FBLA advisor and a key organizer of the annual Klamath Community College Business Skills Academy. He also volunteers as a youth soccer referee and was involved in the community-wide effort to successfully obtain the Robert Wood Johnson Foundation grant. Cisneros says every day he learns more about himself and about teaching. 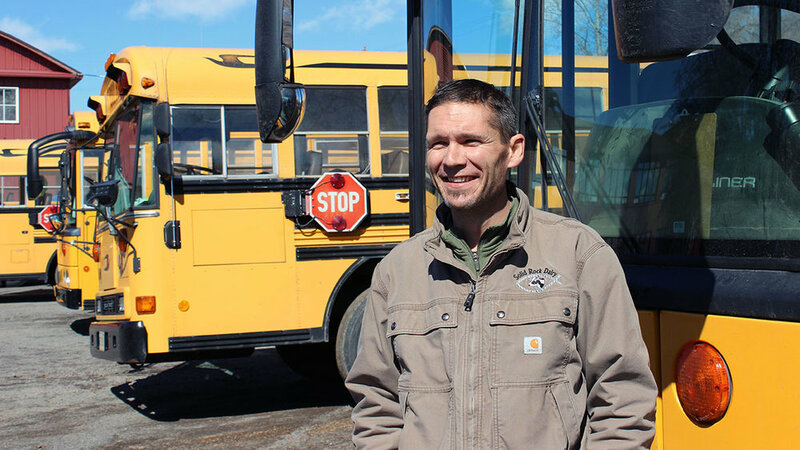 “There are better ways to pass things forward,” Bonanza bus driver Willem DeJong informed a fifth-grader who had tossed an item to a classmate. Then he turned, smiling at another student who called his name. 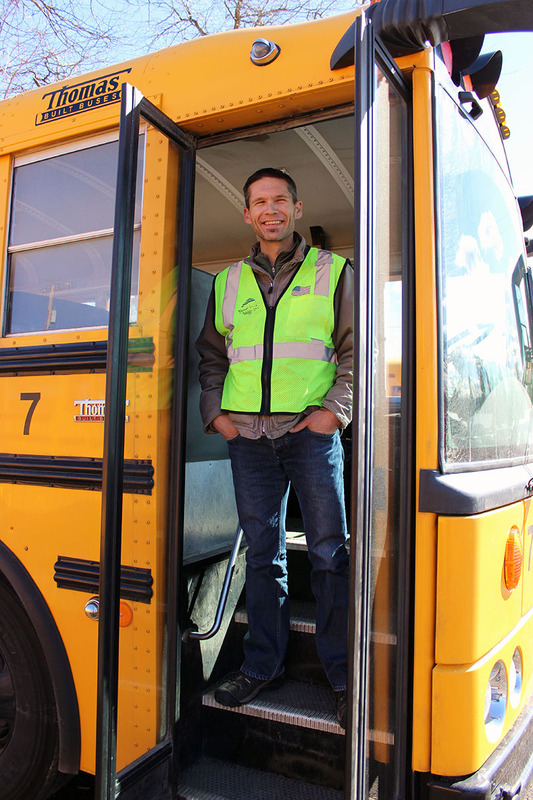 DeJong, 42, who also is a pastor at Bonanza Community Church and community youth group leader, believes he is where he is supposed to be: Driving school bus for 68 students who attend Bonanza Schools. The Crystal Apple Award winner has been driving bus for the Klamath County School District since 2012. His 211-mile daily route (100-plus miles in the morning and again in the afternoon) includes Bly, Beatty and part of Sprague River. He starts at 5:15 a.m., picking up his first students at 6:15 a.m. He knows the area well – he was born and raised in Bonanza and attended and graduated from Bonanza Schools. The current high school principal, Art Ochoa, was his English teacher. Ochoa, elementary school principal Jennifer Hayes and vice principal Heather Wright joined nominated DeJong for the Crystal Apple. DeJong volunteers hundreds of hours in the community and at the school, serving as an ASPIRE and Bonanza CARES volunteer, a mentor for local youth through youth group organizations and chaperoning students on field trips, they said. He also supports students by attending school activities and sporting events. He chatted with elementary students the other day as they waited for the older students to join them. He smiles and joked about his job, but it was apparent he enjoyed what he does. He is a runner and has run a marathon by nowadays logs about 20 to 25 miles a week. 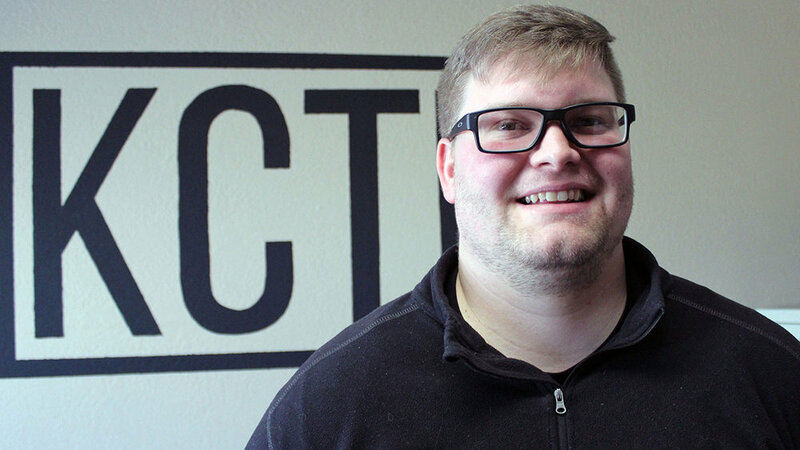 He spends his free time studying as part of his work as a pastor and with a program called Youth for Christ. 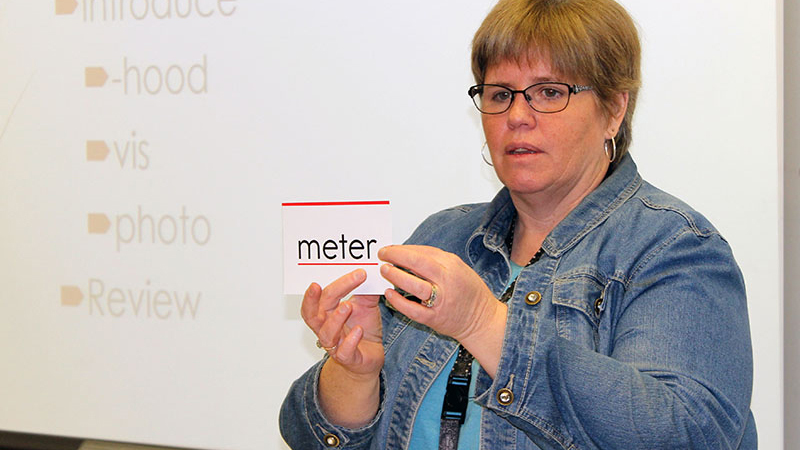 There is one word special education teacher Robin De Long will not tolerate in her classroom. 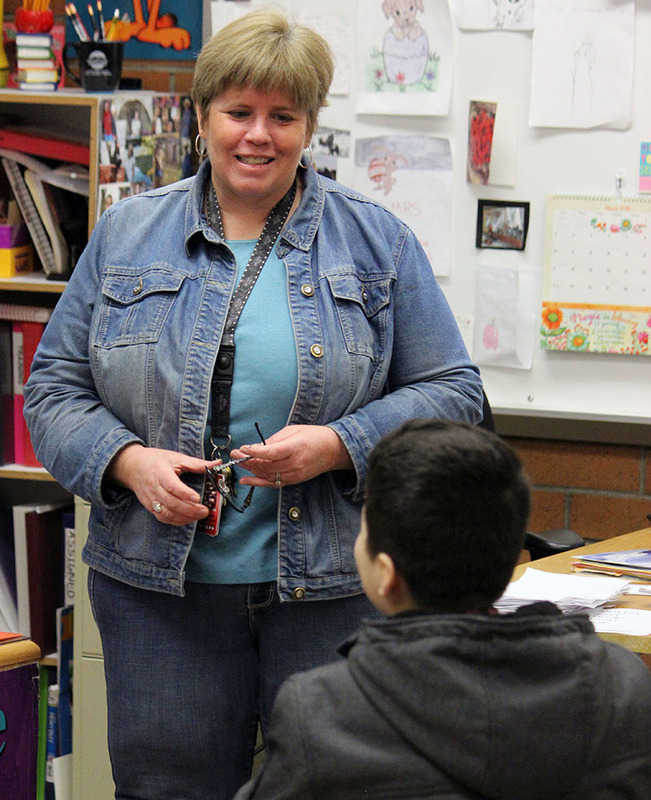 De Long, 57, is in her 12th year with the Klamath County School District and her fourth year as a resource special education teacher at Brixner Junior High School. She was nominated for the Crystal Apple by two co-workers, both teachers who say her tireless work allows her students to thrive and find the best educational route for each one. Aaron Von Tersch, social studies teacher at Brixner, called De Long one of the most motivated teachers he’s ever had the pleasure of working with. 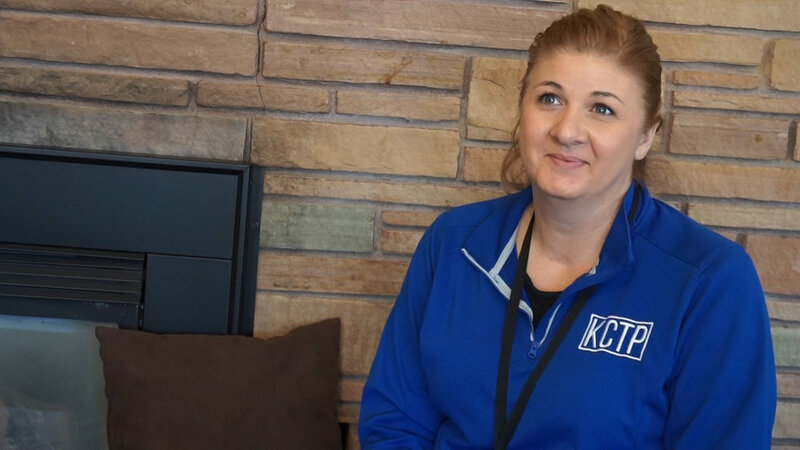 Before entering the teaching field, De Long worked as a child abuse forensic interviewer for CARES in Klamath Falls and as a child welfare worker for the state Department of Human Services. Since Randy Denson took over as head teacher of the Klamath County Transition Program three years ago, its students have become part of the Klamath Falls community, operating businesses such as Jo2Go, a coffee cart; Clean Sweep, a janitorial service for the city of Klamath Falls; and Lunch Box Catering, a meal delivery program. And the community has noticed. Denson was nominated for the Crystal Apple award by both a co-worker and parents of young adults in his program. The program, which Klamath County School District took over five years ago, teaches independent living and job skills to adults ages 18 to 21 with moderate to severe disabilities. In addition to their businesses, students are involved in town meetings, leading the Pledge of Allegiance. They volunteer at the animal shelter and are involved in sports activities. They learn to cook and experience the joy of community service. Denson, a 2010 Klamath Union High School graduate, as a youth volunteered in his mother’s special education classroom. He then went to college, studied special education, got his teaching degree and started his career as a resource/special education at Henley Middle School. He was there one year before taking over the KCTP. Currently, there are 25 young adults in the program. 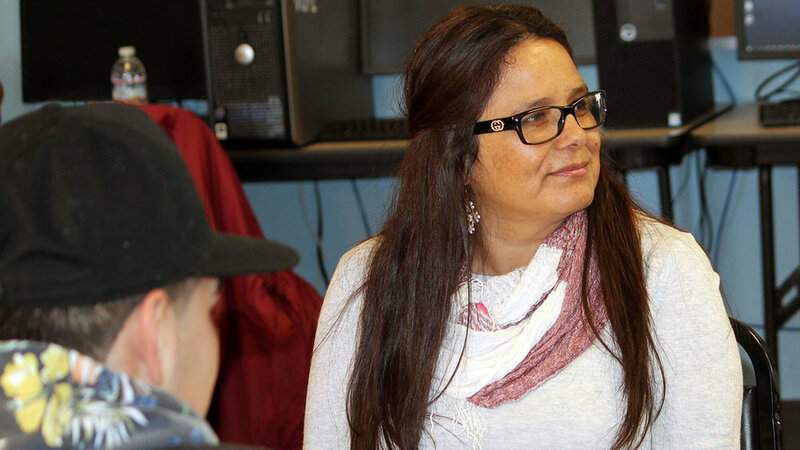 Malakar, who moved to Klamath County from Mexico at the age of 14, now speaks three languages – Spanish, French and English. She was nominated for the Crystal Apple by Angela Wallin, vice principal of Lost River Junior-Senior High School. “Vita is a role model, especially for Hispanic students in our district,” Wallin said. “She always emphasizes the importance of receiving an education and the difference it has made in her own life. For many students, she is their advocate from kindergarten through graduation. She continuously builds encouraging, mentoring relationships with students and their families. I credit her for many students preserving through challenges to earn a diploma. Malakar assists Spanish speaking and migrant families throughout the district with school registration and helps them connect to programs and resources both in the schools and their communities. When families are unable to transport their children to needed medical appointments, she provides transportation and interprets for families if needed. She also makes home visits on behalf of the schools. She frequently participates in IEP (individual education plan) meetings, interpreting and translating complex education jargon and test results in a manner that parents can understand. The 52-year-old graduated from Lost River Junior-Senior High School in 1985 and started working for the district in 1990 as a paraprofessional at Merrill. She has worked in her current position for the past 18 years; she also is the secretary for the district’s migrant summer school program. Malakar understands from personal experience the needs of migrant families and English language learners. She did so listening to English being spoken around her in the classroom and by watching television. In high school, she took French language classes and easily picked up that language. Malakar enjoys her job because of the families she helps and the long-lasting relationships she’s able to establish. “Through the years I’ve been very blessed to meet a lot of families -- families from El Salvador, Nicaragua, Honduras, and of course Mexico,” Malakar said. “It’s been great to see kids graduate who I’ve known since they were little, and now many of them have families of their own. Dena Morosin is one of the most requested teachers by parents at Shasta Elementary School. She also is the person other educators rely on for training in Google Classroom and the classroom funding site Donors Choose. Morosin, 46, who teaches fourth-grade at Shasta, was nominated for the Crystal Apple Award by Stephanie Harris, a teacher at Mazama High School. Morosin has taught elementary school for 19 years, the last five in the Klamath County School District. Work for her is teaching 22 fourth-graders math, reading, writing and social studies as well as life lessons such as goal setting and perseverance. the class with an Olympic athlete. That athlete (this year it is Olympic bobsledder Carlo Valdez), through monthly videos and a live chats, mentors the students on goal setting and leadership, among other character-building skills. Chris Rajnus had never made soap before, but that didn’t stop her from teaching young adults in the Klamath County Transition Program. “Skylar, can you go ahead and boil some water?” she asks one of the students. As Skylar starts his task, she lets each of her students smell the shea butter that they will turn into scent- ed bars of soap. 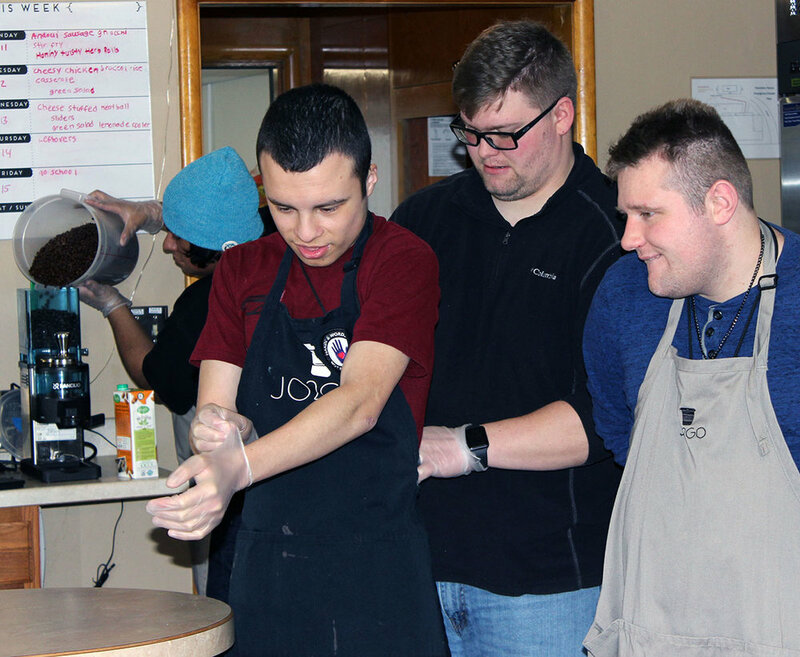 The school district’s Transition Program teaches independent living and job skills to adults ages 18-21 with severe-to-moderate disabilities. It is Rajnus’ fifth year as a paraprofessional and substitute teacher with the program. Her job is to help students learn those life skills and she supervises the students as they operate the program’s business – its coffee carts, Jo2Go, and janitorial service, Clean Sweep. She helps students learn everyday life skills as well, such as hygiene and how to do laundry. Nancy Denson, special programs principal, nominated Rajnus for the Crystal Apple award for her ability to help young adults with disabilities lead productive, happy lives. Rajnus, 43, is a Bonanza Junior-Senior High School graduate. Before finding her calling working with Transition students, she worked as a janitor at Bonanza Schools and in the kitchen at Henley Middle School. She was a one-on-one paraprofessional at Henley High School for three years before taking her current position. 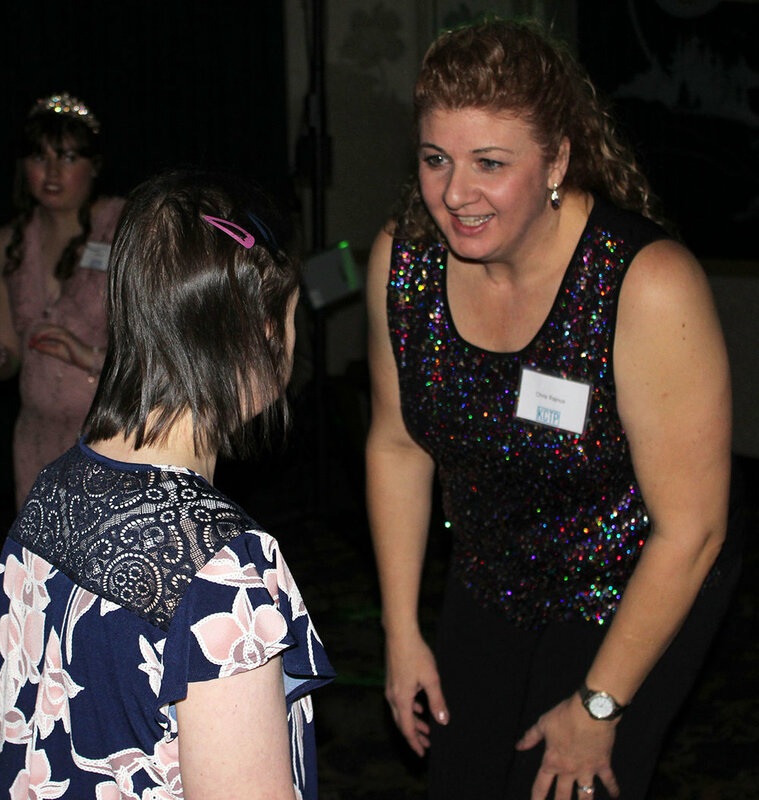 In addition to her work at the Transition Program, Rajnus volunteers with an adult social group; fundraises for and volunteers at youth sporting events; and volunteers for extra activities for students, including the Snowflake Parade, dances, and graduation day activities. Geralyn Smith has spent 28 years teaching kindergarten, the last 20 at Peterson Elementary School. She is known for meeting the individual needs of each student as well as fostering lifelong learning in her students. As a staff member, Smith is actively involved in various roles, serving on Peterson Elementary School’s PBIS and safety teams. She also is a member of the district’s Academic Freedom Committee. Smith recently served on a state-level committee evaluating changes in the Oregon Kindergarten Assessment, which is given to all kindergarten students in the fall. She is actively involved in the Klamath County Education Association’s union as an RA delegate. She has been a member of the Klamath Chapter of the Oregon Association of Education of Young Children since 1993, and has helped plan, assist and conduct workshops at the chapter’s annual Early Childhood Conference. Smith also is instrumental in the planning and success of the Children’s Learning Fair, which is attended by more than 600 young children and their families each year. 28 years teaching kindergarten, three years teaching third grade and six years as an early intervention specialist. She started at the Klamath County School in 1997, teaching for two years at Stearns Elementary School before moving to Peterson. Travis Fast, principal at Peterson Elementary School, called Smith a distinguished teacher and an outstanding staff member. “She is a very nurturing kindergarten teacher and does a great job developing quality character traits in our students,” he said. The Crystal Apple Gala begins at 7 p.m., April 16 at the Ross Ragland Theater. Doors open at 6:30 p.m., and the public is encouraged to attend and celebrate our awardees. Admission is free, and both the Henley and Mazama High School choirs will perform at the event.